Grohe concealed-mounted shower systems include all important elements such as a head shower, a hand shower and a concealed-mounted body for easy installation in one set. You do not need to pay attention that the individual parts fit together, and you can also be sure that you do not forget anything. Put together your desired combination and choose, for example, from round or square overhead shower and thermostatic faucet or mixer. What are the advantages of a concealed-mounted shower system? The concealed-mounted version is particularly suitable for new constructions as the concealed-mounted body can then be installed in the wall right from the start. The technology and all pipelines are invisible in the wall and a shower rod can be eliminated to creates a maximum minimalist image. Which GROHE concealed-mounted shower systems are available? If you prefer a concealed system in which the connections between the individual elements and the complete technology run completely invisible behind the wall, then you can decide for GROHE SmartControl shower system or Grohe Grohtherm SmartControl shower system with your desired elements. Experience maximum showering experience with minimum visible elements. Depending on which system you prefer, your shower is decorated with a round or square showerhead. The thermostat and the mixer are respectively used in the same form. The SmartControl operating element is impressive above all by its elegant appearance and a very easy operation simply by pressing and turning. What are the characteristics of Grohtherm shower systems? As a flush-mounted shower system, you can opt for the Grohtherm range, among other things. 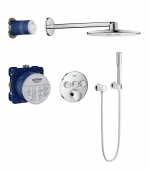 These shower systems are available in different versions, such as the SmartControl version. Here you can control all shower functions by pressing and turning a knob. The flat design of the thermostat optimally supports the reduced optics achieved by the flush-mounted installation. Put together your dream combination and enjoy the relaxed showering comfort with easy operation. The overhead shower has two types of spray: the ActiveRain jet and the Pure Jet, the hand shower is equipped with a universal jet. In the flush-mounted versions as a shower system, all central components are usually preserved in the set (please pay attention to the article description). This also includes concealed installation body and wall connection bend. 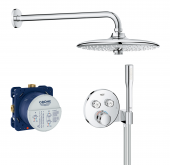 Depending on your individual taste, your Grohtherm shower system can be equipped with square or round head shower in varied sizes, rod hand shower or round hand shower and SmartControl thermostat or thermostat batterie.